Punk rock staples Down By Law are back with a brand new studio album simply titled “All In”. The 11 track album is the bands first studio release in five years and features the group’s classic 90’s lineup of Dave Smalley, Sam Williams, John DiMambro convening for the first time in almost twenty years along with drummer Jack Criswell. “All In” will also be the bands first release since joining Kung Fu/Cleopatra records. If you grew up in the reemergence of punk rock in the 1990’s like me then you most definitely are aware of Down By Law. With classic albums such as “Punkrockacademyfightsong” and “All Scratched Up” solidifying the bands place in the punk ethos long ago the group’s latest release “All In” continues to build on the bands thirty plus year career. The album is a blending of familiarity and freshness that both fans new and old will enjoy. From tracks like “Boredom” and “Undone” which feature thumping four on the floor rhythms to the Echo laden “Infatuation” and, the haunting closing track “Dear Fate” which at the start creeps along like a low lying fog before a perfectly timed solo helps transition to a slightly more upbeat back end which seemed to serve as the proverbial light at the end of the tunnel for the songs subject matter. 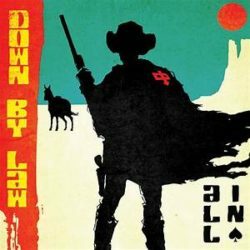 The reuniting of Down By Law’s classic lineup is on display from beginning to end with “All In” and they more than deliver! From catchy lyrics to upbeat instrumentation the group provides listeners with an album that is new and different while still retaining the elements which endeared them to fans over thirty years ago. No fancy studio tricks or filler tracks here. Down By Law brings it on “All In”. We all know that SEO is very important if you are a company with web presence. If you are looking for ways to get your company raised on Google’s ranks; reaching a wider local audience online and to most importantly get more work…you are going to want to pay close attention to this below! Here is a really cool infographic for law firms for all you lawyers out there!